Standing tall in leafy Ballsbridge, a prestigious Dublin suburb, this 197-room, 5-star property announced its rebranding, becoming first InterContinental hotel in Ireland since 1960. It offers a quiet, sophisticated refuge away from downtown traffic in a renovated Edwardian manor house. 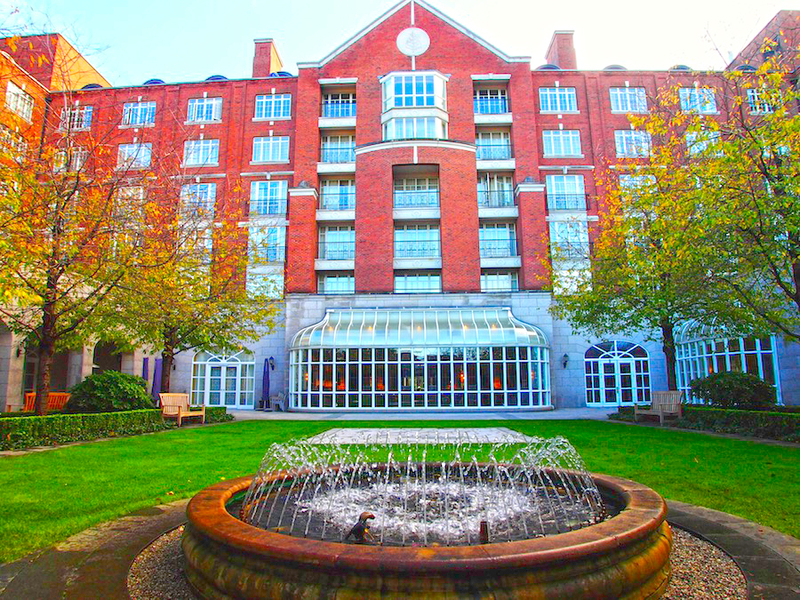 Formerly a Four Seasons Hotel until becoming a member of the InterContinental Hotel Group, it is located a brisk 30-minute walk from the city center and close to the Royal Dublin Society, a major events center, and Aviva Stadium, home to the national soccer and rugby teams. A short, curved driveway leads from a secondary street to the hotel’s archway, with a spacious carpeted lobby beyond featuring a central reception desk on the left and the concierge desk in the opposite corner. Immediately in front is an open lounge – its entrance strikingly decorated with rows of Amarillo flowers hanging upside down. On my visit there a few weeks ago, the lounge was busy with lively family groups, as well as suited business people in discreet conversations. A medley of seating options is available here – traditional tables, comfortable banquettes and cozy armchairs and sofas – and a lunch, afternoon tea and dinner menu. Floor-to-ceiling windows look out on to a rear courtyard garden decorated with wooden benches and an ornate stone fountain, where, in warmer months, guests can dine al fresco. The open lounge and garden are among several different dining venues offered. Another is The Reading Room, which stands to the right of the lounge and boasts a contemporary ambiance with an open fireplace, rows of vases filled with seasonal berries along the mantelpiece and a set of modern, eclectic framed paintings on the walls. International fare dominates the various courses on the cutely entitled ‘Commence, continue, conclude’ menu with Chef Alberto showing his daring nature. One of our starters, for example, balsamic roasted octopus, with juicy tentacles intact, was accompanied by a rhubarb sauce and compact cubes of melon while the second one was tempura-style Clarenbridge, Galway rock oysters with citrus mayonnaise and pickled vegetables, including coins of carrots. For mains, we chose two very different kinds of meat: ‘head-to-tail Hereford beef slow-cooked tongue, tripe and tail’ with roasted vegetable mash, quince puree, and cinnamon jus and loin of Wicklow venison with duxelles, brussel sprouts, glazed baby carrots and cashews. Both dishes were washed down with a Chateau Cantemerle Haut Medoc Grand Cru 2004. A larger restaurant, also located on the ground floor, features a row of large bay windows that look out on to the courtyard garden. Breakfast is also served here. Next to it is an intimate bar with comfortable leather armchairs and an impressive whiskey selection and a few craft beers. Our upper floor suite, designed in light-hued country elegance, was spacious. The sitting room – with a narrow outdoor balcony attached – was bathed in light pouring in through large windows overlooking the hotel’s landscaped gardens, the tree-lined streets of nearby Ballsbridge and Donnybrook and the city’s roof-scape beyond. Emphasizing its coziness, the room’s central sofa featured a bold rose floral motif. Two accompanying yellow armchairs with a low slung, wrought iron coffee table between, a writing desk, classic table lamps and a large dining table made up the rest of the furnishings. The walk-through bedroom was also spacious with two, padded chaise longue with floral motif, a mahogany table and a floor-to-ceiling television cabinet. The bathroom, with gray speckled floor, and lemon-colored walls, incorporated a double sink, separate bath and shower and a walk-in wardrobe. Toiletries were L’Occitane. A spa in the hotel’s basement features a 14-meter (46 feet) pool with an adjoining outdoor terrace, a Jacuzzi, separate male and female women saunas and steam-rooms and four treatment rooms. If you seek a comfortable hotel away from the hubbub of downtown, the InterContinental Dublin is a fine choice, providing relatively easy access to the city’s highlights while offering a high degree of suburban tranquility. Posted in Luxury HotelsTagged Aviva Stadium, breakfast, Chef Alberto, city center, dinner, Dublin, Edwardian, Failte Ireland, fine dining, Four Seasons Hotel, Galway oysters, Hereford beef, hotel, InterContinental, Ireland, L'Occitane, manor house, Medoc, restaurant, romantic, royal Dublin society, The Reading Room, tourism, travelBookmark the permalink.